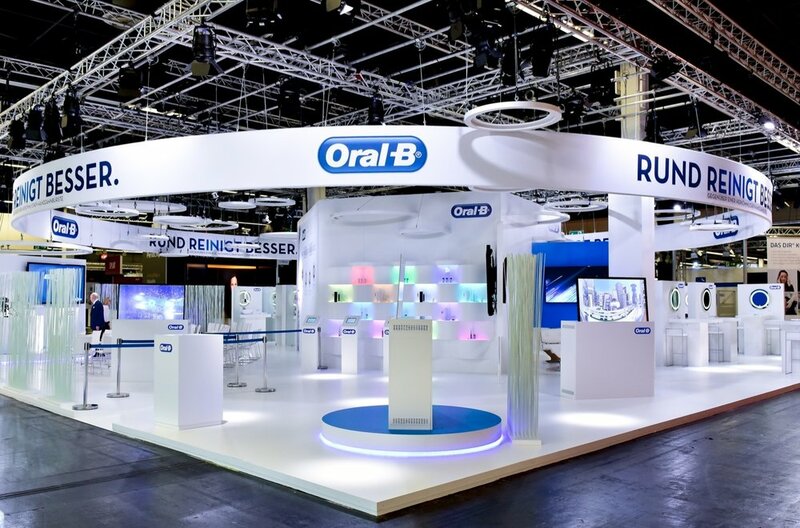 Oral-B appointed zerotwonine to design and build an exciting new booth for POH events. We're happy to be responsible for the Oral-B fair presence with over 10-20 fairs annually, starting with the IDS launch event in Cologne. Refresh booth design to ensure best-in-class stand out at dental exhibitions. Deliver a sleek, cutting-edge design that mirrors Oral-B’s commitment to innovation. Provide a superior consumer experience vs competitors. Around the baseline "Rund reinigt besser", we designed and produced a modular booth, which is like the Oral-B Genius 9000: intelligent and revolutionary. We also created a customer journey to let customers experience the product. From keynotes, live product presentations, tooth brushing stations and a photo area to the integration of virtual reality and intelligent path optimization via illuminated rings above the entire booth.